Well, this week has been full of excitement! On Monday Loopy Ewe put up Sokkusu Original in her update – 3 of the 20 colours have sold out (2 are my favourite Siffie & Lorelai) – you can see the yarn here. Fly Eye and Wooing Ruby were really hard to photograph – so they don’t look quite true on the Loopy site. Fly Eye looks solid on the Loopy site, but it has subtle varigation. And Wooing Ruby is bright deep red! 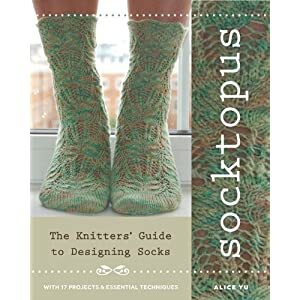 The other thing is that a friend sent me a link to a book on Amazon – my book! 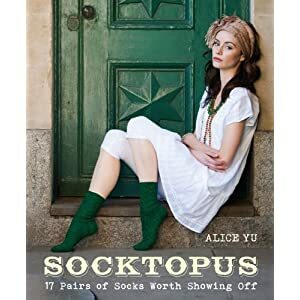 Socktopus is available for pre-order on Amazon.co.uk and Amazon.com, though the US and UK editions have different covers. This is the UK edition, with my Shur’tugals on the front.